Ear training music app and virtual piano to help you learn perfect pitch, test your aural note recognition and be a better musician.Absolute Pitch is a musical ear trainer that uses a unique method to teach you absolute or perfect pitch. This is the ability to name any note played, without the aid of the reference note required by a musician who has only relative pitch.The software plays notes in an atonal, rather than tonal, context to reduce the possibility of using relative pitch.You learn a particular note by listening to a random sequence that includes the note. Whenever the note is played, your aural recognition is reinforced by visual stimuli that help your brain associate the sound of the note with its name and position on the piano keyboard. You can optionally use colours to further strengthen this connection.When you are confident that you know the note, you will want to take a test. Tests can vary in difficulty from identifying just one note in one octave up to naming all notes in all seven octaves. 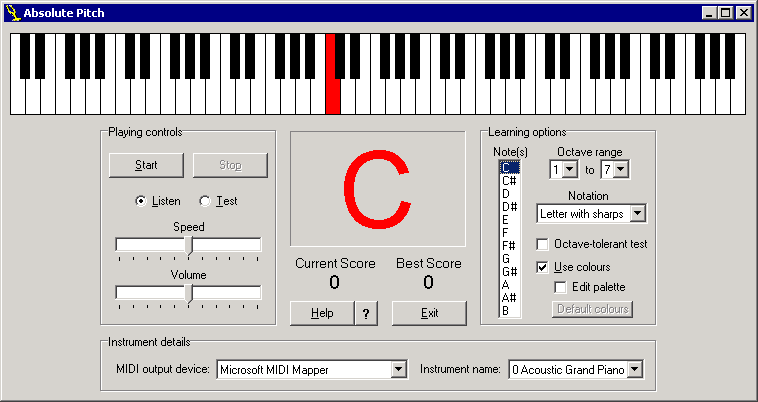 To make a test easier, you may want to make it octave-tolerant, meaning you don't have to get the correct octave, only the correct note name.With its realistic piano sound and near full-size piano keyboard, the application can be used to play polyphonic music using your mouse, computer keyboard or touchscreen.